We are currently recruiting two Consultant Dermatologists to join a friendly and supportive team, based in Hawke’s Bay – an area well known for its warm and sunny climate, fine wine and Art Deco Architecture. The successful candidate will provide modern quality care to patients, ensuring as part of the Department of Medicine’s team that the Dermatology Service’s contractual requirements are met in a timely, efficient and cost-effective manner. Clinical services will include outpatient, community assessment and management of people requiring specialist dermatology care, and community based support services. Clinics are provided in Hastings, Napier, Wairoa, Waipukurau and Gisborne. Strong clinical liaison with other DHBs will be maintained and formalised networks with tertiary centres further developed. 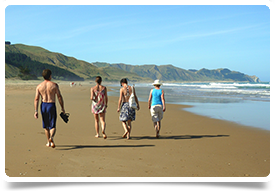 The region is set on the beautiful and famous coastline of the East Coast of New Zealand’s North Island. A well-known holiday spot for Kiwis, you are also only 3.5 hours’ drive from New Zealand’s capital City Wellington, a 2 hours’ drive from the famous Lakes region, and a 3.5 hours’ drive from the North Island premier skiing destination, Mount Ruapehu. With over 2,245 hours of sunshine each year, and warm, dry summers this district is the country’s oldest winemaking region and is New Zealand’s leading producer of award winning red wines. To complement the sublime wines, it is further renowned as a gourmet destination for fresh seasonal food, exotic and organic meat, fruit and vegetables grown and processed in the bay. Country-style markets provide an opportunity for you to meet the growers and sample their wares. It is also home to a world-class concentration of Art Deco architecture, fresh local produce and artisan food producers complemented by a vibrant arts scene and a rich Maori culture. The region also hosts a number of ‘must see’ events throughout the year. If you are seeking a laid back, friendly and cultural city then this is it. Please see here for more information on Hawke’s Bay. We will provide support through the medical registration and visa application process. We are registered with the Immigration Advisors Authority in New Zealand.